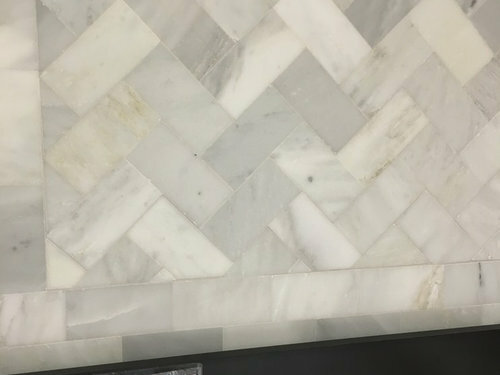 Bathroom tile help! Are my choices too much? I'm redoing a small full bath. I've selected honed marble and will do a 4 foot subway tile wall around the bathroom. I'm considering doing a marble mosaic flooring that might be a bit much to use wall to wall. on the other hand, since it is monochromatic it might be just the right element to boost the design. All thoughts are appreciated. I'm also including a pic of my sink console. The plastic is on these causing the sheen. 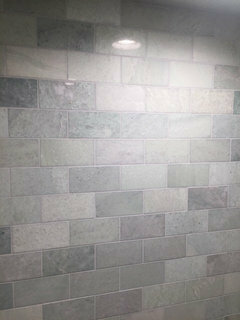 This is the wall tile laid out in the showroom I would use a brick pattern. I love that mosaic and don't find it too much at all. Your elements are beautiful. 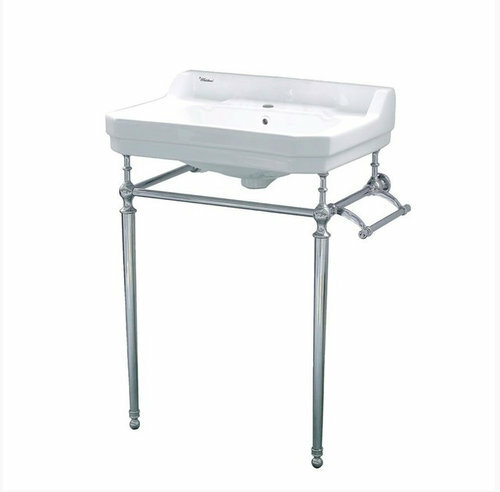 The console sink is great. The bathroom is going to turn out so well. I think that the mosaic tile would be beautiful! I can understand your concern about the materials being too busy but I think that the floor tile is simple enough to not only work, but be a great design feature. Hope this helps! Small bathroom tile choice help needed! Hi Kdeco1971...I just came across your post and LOVE the vanity choice. 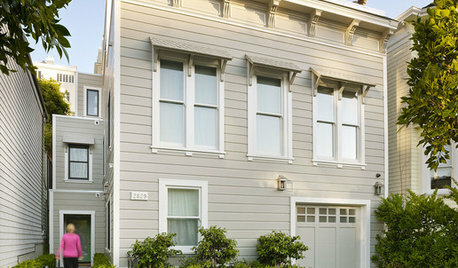 We spec Restoration Hardware pieces on many of our projects and our clients love the quality and look. I would love to have you come in the showroom so one of our design team members could help you to select finishes for the rest of the space. 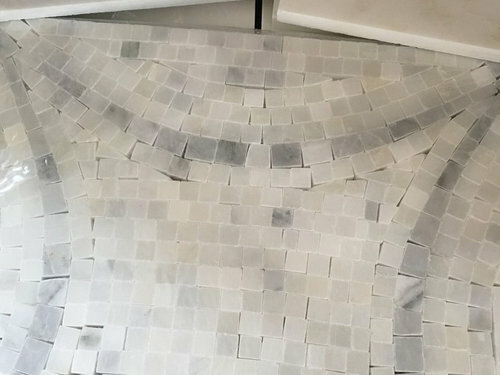 We have an extensive offering of subway tiles, white marbles and mosaic options for you to look at and could get you set up with some samples. 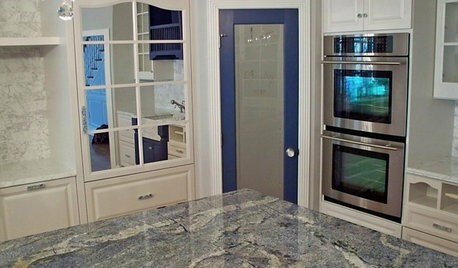 Please feel free to email me @ alissa@cabochontile.com with any questions or pop in the showroom to see our offerings. We are located on Girard Avenue in La Jolla. Thanks! Need help with tile choices in bathroom renovation! Congrats on the new bathroom! 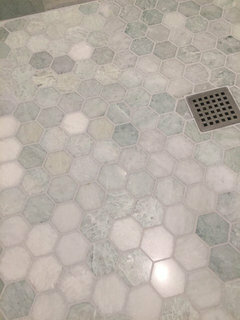 I love the marble hex with the white subway tile - I currently am using that in one of my bathroom renovations. Its such an updated clean look. But just beware, you will have to seal the marble floors every once in a while to keep it looking its best. Best of luck with your beautiful new bathroom! Help with Bathroom Tile Choices. I have attached a picture of the Susan Jablon tile I was thinking of and a photo of the way the bathroom will be laid out. That back wall is 10 feet long and 9 feet high. 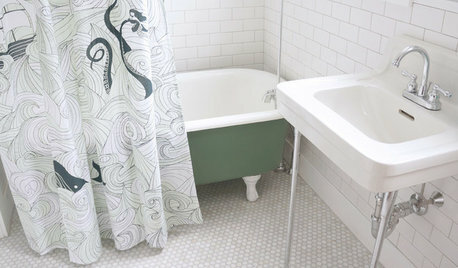 I love the tile but am afraid that it might be &quot;too much&quot; for that large of a wall. What do you think? Help-my husband wants to tile the ENTIRE bathroom-entire ceiling too! As much as I like hex tile, that is not the answer to every question. The mosaic is much nicer looking. The hex tile is more of a budget minded choice in comparison. You're so right! I'm expecting my husband to vote for the hex, ha, ha. I agree. I hesitated on the hex because it seemed so boring and expected. Thanks for your input! Trust your choices...they are beautiful!!! Really gorgeous choices. Stick to your choices and don't let your husband talk you out of it. 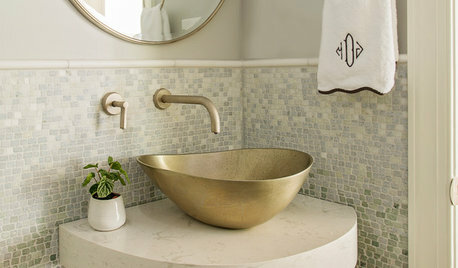 Hex is nice...but that mosaic is going to up the glamour of your room exponentially without being busy or fussy. I also like the wall tile in the herringbone pattern. You mentioned a brick pattern, I think you could do either one and still stick with all the choices you've shown us. It is going to be lovely. I hope you'll post pictures when the room is complete. Not too much at all. 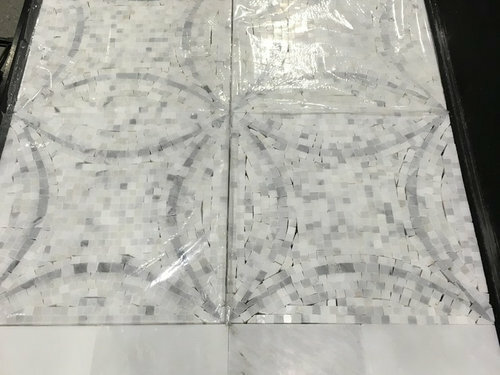 Now, as for professional installation of those small mosaic sheets....it's important to minimize the grout lines between the sheets to make it look as seamless as possible. Pro's use some tricks for that. 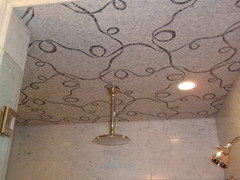 Here's a close up of one install on a ceiling. You can still see the lines where the sheets line up, but they are minimal and from usual viewing distance, pretty much go away. Those little mosaics can be fussy to set with the best aesthetic, so hire wisely. And careful on that grout choice for the same reason. Good luck with your project. Tricia Perez thanked Dragonfly Tile & Stone Works, Inc.
Wow! That ceiling is incredible! Thank you all for your input. I think I will go with the mosaic. My husband hasn't seen the sample yet, so we will see. I will try to stick to my guns and will definitely post pictures (and I have a great tile guy lined up, it's his specialty and he came highly recommended, so here's hoping!). Great, and be sure your installer lays out the wall and floor tile in advance to "shade" it, as there are variances in natural stone and you want it to blend nicely. Tell him you want to see the shading result before install so you can move a few around, or eliminate any you don't like (order enough extra). Yes! My tile store contact also told me to order extra and select the stones I want. I can return any of the unused pices after install so I will for sure order plenty extra. Simple and elegant. You nailed it. Tricia Perez thanked Zalco/bring back Sophie! I love your choices and would use that mosaic on the floor in a heartbeat. Follow up question, I have large molding in my home. Will it be weird to have the floor, white wood molding and then the wall tile? Marble molding is not in the budget to keep the continuity. I guess I'm in the minority here, because yes, I think it's too much . It's too many different shapes of gray tiles. That flooring is not right. The pattern is too big while the individual tiles are too small. Pick different flooring and you can make the rest work. You're hitting every single trend with the color, and the subway tile, and that sink. Maybe pick something that is NOT a trend, that will also help to tone the design down a bit and hopefully make it last longer when all of those trends run out. 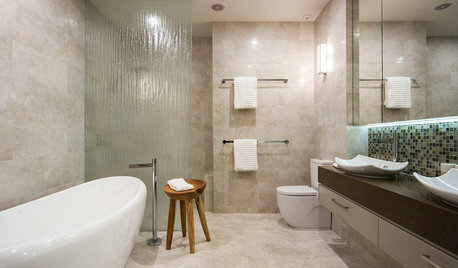 I would use that pattern on the vanity wall and a larger field tile on the floor. You can use the background in the mosaic if they have a matching one on the shower floor. You can also use that pattern on a shower feature wall, the plain version of it on the shower floor and a matching larger field tile on the rest. I wouldn't use a brick pattern with that as they will flight each other. Not at all, keep going! I think you're onto something with your selections thus far. Keep us updated. Cpaul1, that's funny. I went the marble route because it is classic and NOT trendy. I live in a 100 year old house and subway tile and that sink and marble would be very authentic to the period and style of my home. The floor tile perhaps not, but I was thinking that would be the added flair to make a design statement. Thanks for your input! Wood moulding will be fine. Your choices are classic. 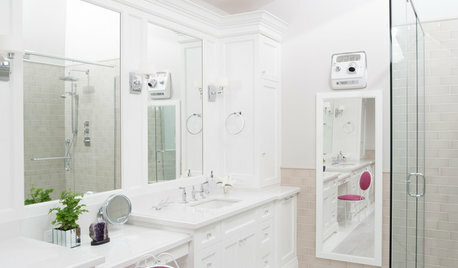 White marble bathrooms with console sinks were gracing many beautiful houses, though of course some people were not lucky enough to have them (like me living in a suburban house with a uninspiring bathroom when I was growing up.) Playing with different shaped tiles in the same color family, including the gorgeous mosaic is not trendy at all. I am the first person to tell people the gray trend is over, but white marble in bathrooms and kitchens has been here and will be here forever- just more of us get to have the look now than in the past. Do keep us posted on how things turn out. I really like your choices! 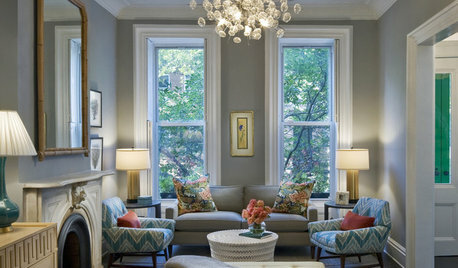 Wonderful blend of designs, but monochromatic colors....nice! Tricia - agree with you that it's not trendy at all. 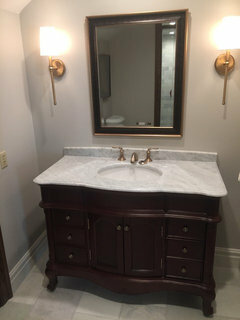 I chose marble for my bathroom because I have a very classic (older looking - was built in the 80's but looks like 1800s) home with lots of existing marble. I think marble is timeless. Just be sure if it's honed to seal (I did 2x) and then grout, and seal again. It soaks it up like a sponge. The polished (if any was) doesn't need the seal as much, but should not have sanded grout (or if used, just make sure they sponge it off), you could use unsanded or epoxy (which is more $). Elsaduty, thanks for your input. Can you tell me more about sanded grout? 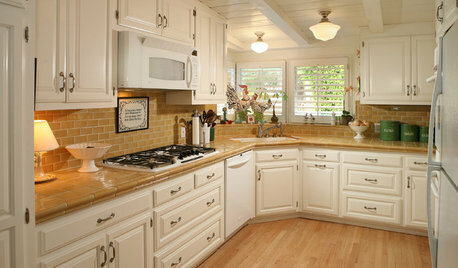 I'm torn between a light grey grout and one that looks a bit more like the color of cement for an older feel. I used Whisper Gray Tile Shop grout and it's perfect. It is the lightest gray available. I grouted a demo sheet myself first to check it out. Great $20 spent to try a grout color before you commit!! You aren't supposed to use Sanded Grout for Polished stones as it could scratch them. We ended up doing it anyway (not heeding my own advice I guess) but our Tile Guy was very careful with a sponge and delicate. Sanded grout holds better than Unsanded also. On our honed floor we also did sanded. So for my master if I have this dilemma, I would go Epoxy grout. More $ but best choice. My bathroom I'll share pictures of will hardly be used (off a bonus room, not any bedroom). Tricia, I would recommend the lighter grout over the cement... even the lightest gray I did I believe has the feel you're looking for. Too much darker, to me, would feel really dirty to me. 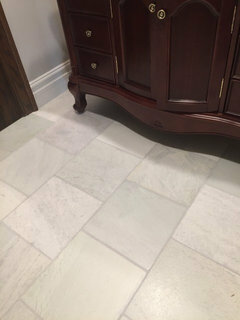 Your tile is so pretty and elegant it just needs a touch of the gray from the veining. I would love to do white but I’m afraid it isn’t practical for a bathroom. Thanks for the rec of whisper grey. I will definitely look for that. Also, thanks for explaining the differences in the grout! Tricia, did you install the mosaic floor? I am considering something similar. Could you post pics? Also any install tips (sealing, grout type and color etc)? How is it holding up to use?